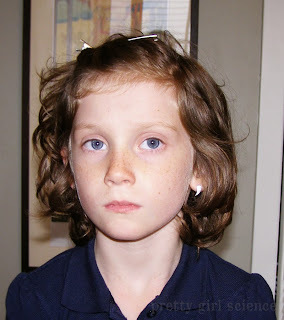 Now, since I'm using my lovely firstborn...there is no makeup here. For kids, you want to keep this fairly minimal since you will be washing their face later. If I were doing it on myself, I'd apply my primer, foundation, concealer, contour, etc during this step. Once your face is done, apply your eye makeup however you want. 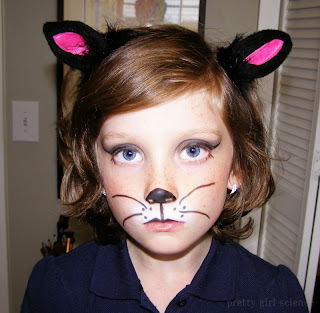 I went with a wash of black eyeshadow and a super-dramatic cat eye. I also drew some little faux lashes on the underside. 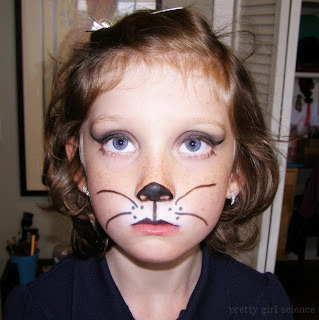 For adults (and the non-squirmy) I think a more dramatic eye would be better...and definitely mascara. 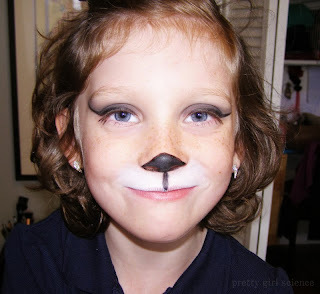 Using my (aging) felt tipped liquid liner, I drew a small ^ shape on the end of her nose, just to give me a starting point. It's good at this point to take a step back, and make sure it's straight. Then fill in the end of the nose, including the nostril area, with your eyeliner. Keep in mind that you want a bit of an upside down triangle/heart shape. Set the liner with black powder shadow to make it look as opaque as possible. You can use a white shadow base (like Nyx Milk, or their white shadow primer), but I used Manic Panic Gothic White Foundation, applied with my knock-off beauty blender. 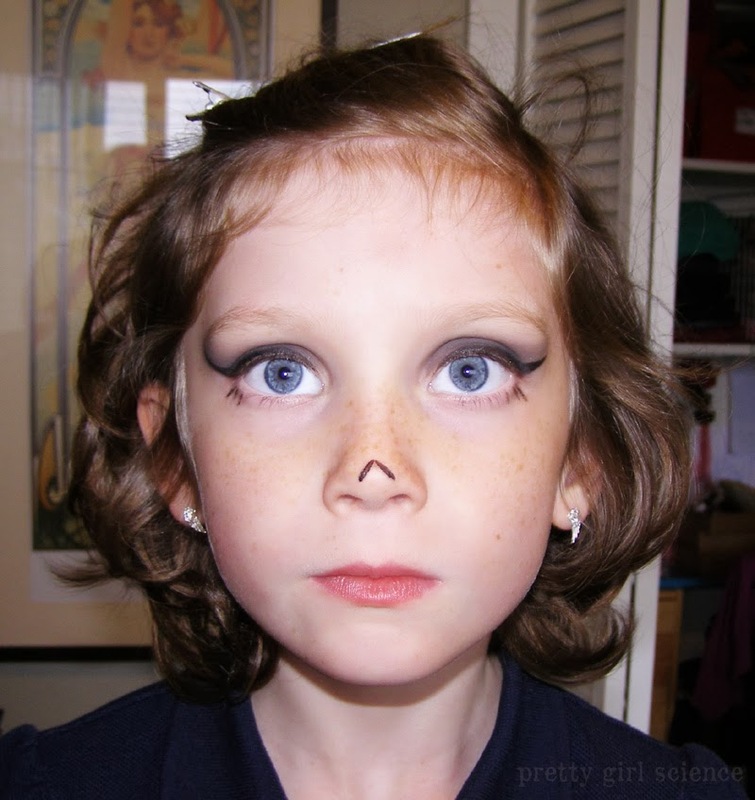 Once you have the white where you want, draw a line right down the center of the philtrum. 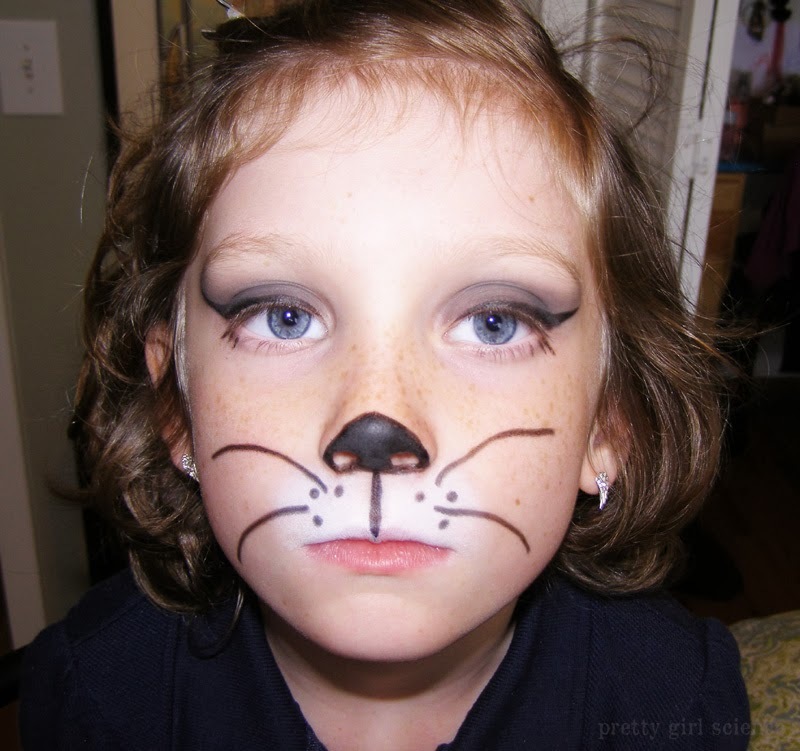 I added whiskers with a regular black kohl pencil. When you do the dots, press the pencil down and twist it, so the color will deposit over the creamy foundation. For a longer-wearing look, waterproof gel liner would be really great for this step. I applied black lipstick to just the upper lip. It will smear over time, but dammit if it doesn't look cute at first. If you aren't squirmy, it might be a nice touch to draw curved lines starting at the corners of the lips to give more of the appearance of a rounded muzzle. 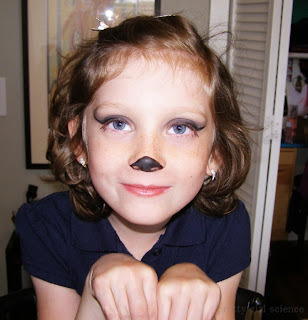 Step Six: Add Ears and Get Dressed! We've actually had these ears forever and ever. I clipped them in under the crown layer of hair, just to give them a more natural appearance. And that's pretty much it. Throw on some black clothes and call it a day. 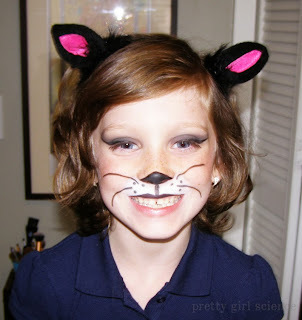 This would be a really school friendly costume, since most of it depends on your face. I think this would also be super comfortable too...which is why this is what I will be doing to my own head on Halloween! her reaction to seeing herself. She definitely enjoyed it. Most adorable kitty cat ever! Perfect model. hehe, good job mom, and good job little Charlie girl!!! Love ya! <3 She is a pretty good model. and I want to add: that song is now stuck in my head! I love The Aristocats! Haha yes! feel my pain!